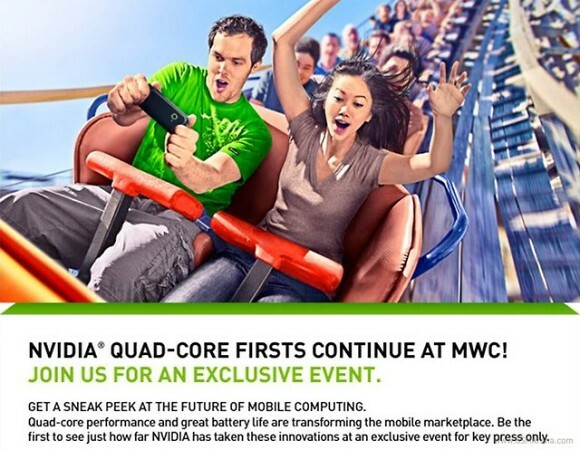 This is not the first quad-core Tegra 3-powered device we've seen (remember the Eee Pad MeMo at CES? ), and no one was really in the dark as to expecting something of this nature from Nvidia in Barcelona this month. Normally, we would assume it might have something to do with the leaked HTC Edge we saw late last year—it certainly fits the profile: Quad-core? Check. Tegra 3? Check. But should the Edge be announced, it will most likely be announced at HTC's event held the day before MWC, and not at Nvidia's "exclusive event." Or could it be the Arrow prototype we saw from Fujitsu at CES? Again, we would assume Fujitsu would have their own booth or event for such an announcement, but who can say what kind of a deal Nvidia has worked out? Whether it's a new tablet or smartphone, we definitely don't recommend trying to steer a roller coaster with it. All jokes aside, check back here for all the MWC goodness, starting February 27th. 8 cores? lol no.. way past 8 cores.. we are upwards of around 50 cores now.. of course not for commercial use. My vision is the same. I'll plug my phone to a working station and work and then put it in my pocket and go home and play, surfe the web and all that. Hope someone takes that lead and turns it into reality.